Hi everyone! Yay! It’s time for the My Favorite Things May product launch! Today, you can see all new products and they are available right now on the MFT online store! Most of the supplies I used for this project are linked in the link-up tool at the bottom of this post. I die cut the Safari Tree from Jellybean Green and Milk Chocolate cardstock. I colored one bunch of leaves with a darker green Copic marker to get more depth. I fixed the tree to the background using foam pads for more dimension. I created the sky using the (FABULOUS) new Cloud stencil, blue Distress inks and a blending tool. Those giraffes are really cute. I think this is just soooo cute! What an adorable card. The kids will love the giraffe in the trees! Cute card design to go with this sentiment. I love how you just show the top of the tree and giraffe. It is a really fun view. Adorable card. Giraffes are so much fun. I love your card! The giraffes have such a cute face. Love the punny sentiment!!! Grest card!! This is awesome! I love the clouds and scene! Your clouds look so "real" and I like how you only used the top of the giraffe/tree (gives the illusion the giraffe is really tall). Very cute! What a great design!! Love how you get the feeling of being in the tree tops!! I agree, the cloud stencil is fabulous! I cant wait to try one out. Adorable card! So fun and cool card!! Your coloring is adorable like Always! Thanks for inspiration! Love this giraffe stamp set and the tree dies! Great combo together to make cute scenes. So cute! I love those giraffes! I love the giraffe's, so cute. Your scene is adorable and your sentiment is perfect! Love this adorable card! It is soooooo cute and creative! Très sympa ta carte avec cette girafe rogolote , j'adore ! Such a cute card, I adore these giraffes! Great sky! This card is adorable! Wow! The giraffe's neck is really long! Such a tall giraffe! What a great card. I really love this stamp set. Thanks! Awww!!! Adorable and funny card!!! Cute card! Giraffe is so sweet! Love the cloud stencil- I think I need to have it. That's one long necked giraffe!!!! Love the idea of just showing the top of the giraffe. So cute. You always have such a unique take on the stamp sets. Love your work. Thanks for the inspiration! Great style of this giraffe card. I don´t want to buy the giraffe..but otherwise if I see this card- I want to have them too. What a match of the long neck of the charming giraffe and the message! So many fun items in this release. Big fun! You're choice of colors are always perfect and I always love your sky blends! This makes me chuckle. Great Card! Cute way to use the giraffe! Fabulous scene, Francine! Just love it! of giraffe - eating out of the trees. Look at the funny face of the giraffe, too cute! Love the cloud stencil you used! I think those giraffes are absolutely the best... and, yay, a stencil for making clouds! Adorable card! Great idea with the giraffe and I love your clouds. So cute! The giraffes are awesome! Great job on the cloudy sky. The stencil look like it will be a great tool. Thanks for sharing. LOVE this adorable card, Francine! Those fluffy clouds are perfect with these cute images and your Copic coloring is fabulous! Haha, this card is awesome. Darling card! Love the giraffe! Great scene, love your soft sky. Very fun card...love that cloud stencil. Adorable use of that long neck. Very creative. So sweet! ! I love how you used the top of the giraffe! Such fun card!! Love the new giraffes!! And I think it's so cute how you put this card together. Love this up-in-the-air point of view! 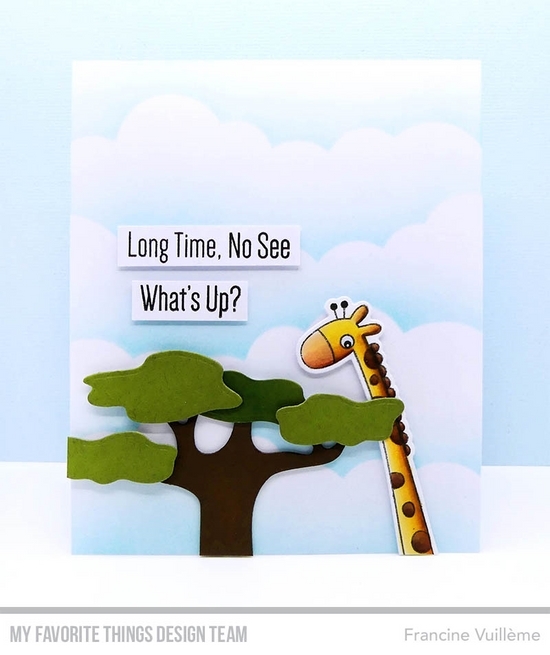 I really like how you used the tree and giraffe together to make such a cute card. I love the way the giraffe is taller than the tree. Great scene. My daughter loves these giraffe stamps! Super awesome and fun card!!! Such a fun card. Love these new giraffes.